This is a Norhtern Kerala dish specially more popular among muslims. It is a pancake made of rice flour. This is a very tasty and easy to make receipe which is usually taken with coconut chicken curry. Pathiri is regularly served during Iftar in the muslim fasting month of Ramdaan. 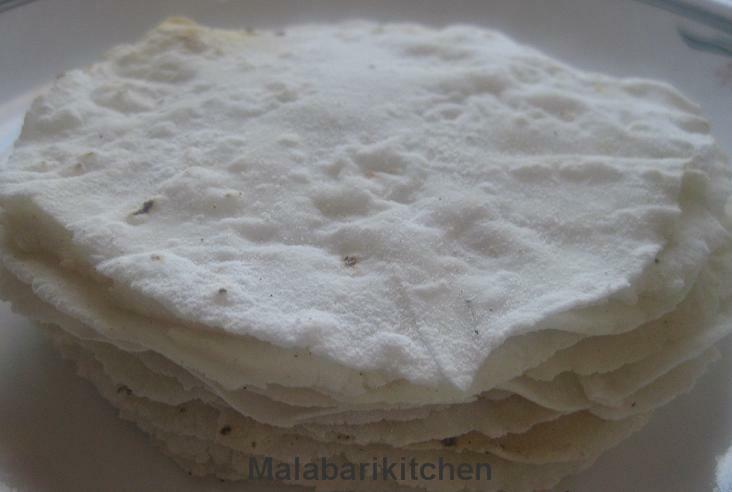 I have already given the recipe of Roti Pathiri which can be found here. =►Boil one cup of water with enough salt. =►When it boils well, slowly add rice flour little by little. =►Stir it continuously and switch off the flame. =►Close tightly with a lid and leave it for 10 min. =►Pour the mixture into a big vessel for kneading. =►Knead it(atleast 5min) and make a soft dough. =►Taste and puffness of pathiri depends on how soft is the dough. =►Make small balls and press it on wooden board. =►Put little bit rice flour on wooden board for avoid sticking. =►Press it until you get thin round pathiri (no need to use oil). =►If u want correct round shape use round cutter or lid. =►Heat tawa or non stick pan on medium flame and place pathiri on that. =►Cook both sides well. Pathiri is ready to be served with chicken curry. It goes well with fish curry and egg curry. 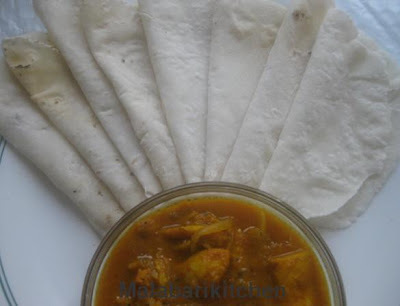 SUper delicious pathiris..love with chicken curry..
Adipoli Pathiri and chicken curry. wooowww. delicious.. pathiri with coconut gravy would be so tasty..